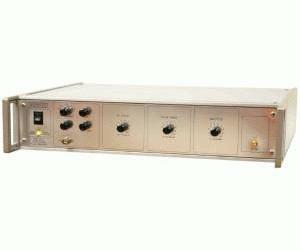 The AVMR series offers medium-voltage operation at relatively high pulse repetition frequencies. The AVMR-1A family provides pulses with amplitudes variable to 10 Volts, and pulse widths variable from 10 ns to 200 ns. The maximum pulse repetition frequency is 10 MHz. The rise and fall times are less than 150 ps. Instruments with the -B suffix include a complete computer control interface. This provides GPIB and RS-232 computer-control, as well as front panel keypad and adjust knob control of the output pulse parameters. A large backlit LCD displays the output amplitude, frequency, pulse width, and delay. To allow easy integration into automated test systems, the programming command set is based on the SCPI standard, and LabView drivers are available for download. The -C versions provide output pulse parameters similar to those of the -B models, but do not include the GPIB or RS-232 interfaces (i.e. no computer control or LCD display). The output parameters are controlled by front panel range switches and one-turn vernier controls. On all -C and -B models, a delay control and a sync output are provided for sampling scope triggering purposes. All models can also be triggered externally using a TTL-level pulse. All models are protected from overload conditions (such as excessively high duty cycle or short circuited load) by an automatic control feature that limits the output power for as long as the overload condition exists. menu or by a computer command. All models include an output DC offset function. The required DC offset or bias is applied directly to rear panel solder terminals. An available option provides an internally generated DC offset (0 to ±5V), which is controlled by a front-panel one-turn control. AVMR units are available with a monitor option that provides an attenuated (20 dB or X10) coincident replica of the main output pulse. Additional options include electronic control (0 to +10V) of output amplitude, pulse width and DC offset. Units with these options also include the standard front panel controls.